“There has never been a sadness that can’t be cured with breakfast food,” quoth the venerable Ron Swanson of Parks & Recreation. Wise advice, but hard to follow if you can’t find spots that serve reliable all day breakfasts. Luckily, Hong Kong is liberally peppered with spots that serve full breakfasts — English, American, or otherwise — well past morning. Tuck into these delicious all day breakfasts to cure your sadness at any hour. This airy, industrial-chic shop, named in honor of the famously diverse street in London, is a temple to the oft-maligned gastronomy of England. Naturally, that means a heavy focus on the one meal England is unequivocally proud of: breakfast. 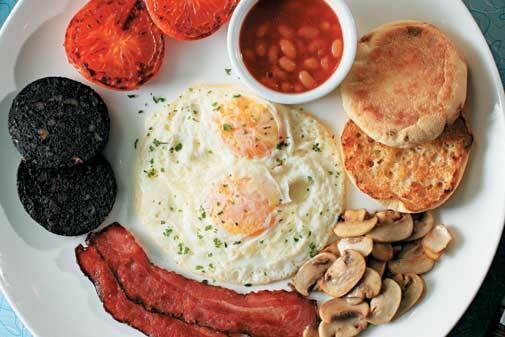 They offer not one but three versions of the full English breakfast, each more decadent than the last. For an extra $25, you can add on some deliciously bloody black pudding. If you have more of an American palate, you can still leave satisfied; they offer six varieties of eggs Benedict, each a prime candidate for the optional toppings of black truffles, caviar, or both (if you’re a real high roller). 18 Grams’ six locations are primarily espresso bars, hence the name — that’s supposedly how much of their signature, locally-roasted coffee blend they put in each cup. They don’t slack on the food, though; you can pair your fresh-pulled cuppa with a long list of all day breakfast items (with some items slightly discounted on weekday mornings before 11). They insist on calling their $108 set an “Aussie Breakfast” to match their short whites and long blacks, but it sure sounds like your usual full English: bacon, sausage, egg, toast, and beans, plus a perfunctory salad. American expats, or enthusiasts of Hollywood movies, will find comfort here: the puffy vinyl booths and tiled bar counters look like they were lifted straight out of a New York diner. The equally-authentic menu covers all the diner classics, like pancakes, huevos rancheros, and massive omelets that are more add-ins than egg, but they also make a mean full English. Plus, they’ve carried over the tradition of staying open 24/7, which means you can indulge in all day breakfast when it was meant to be eaten: three or four in the morning, after a night that calls for some booze-absorbing grease. Green Waffle is another American-styled diner, but instead of presenting a perfectly-preserved capsule of classic diner culture, they go for modernised, hippified versions of diner favourites. As you might have guessed from their name, they specialise in waffles that are so dense, sweet, and buttery that they go down more like a doughnut. The waffles aren’t actually green by default, but they’re Instagrammable nonetheless, especially when topped with fresh fruit and Movenpick ice cream. It’s time to upgrade your brunch club membership past mere weekend access. Here, you can get your breakfast-food fix seven days a week right until close up shop at ten. They have both the usual full English and a more virtuous, European-style “continental set” that features yoghurt with homemade muesli and fresh fruit. Both breakfast sets come with artisanal bread fresh from their own bakery, a bubblegum-pink nearby shop that looks like a postcard of Paris taken through a rose-colored lens. N1 is one of those hip, “third-wave” coffee place designed with laser-sharp aesthetic precision: bare wood tables, antique artifacts curated for prime quirkiness, and a Tiffany blue motif tying together everything from the cups and saucers to the stylish wall art. The all-day breakfast, though, is pure comfort. For just $80 — one of the lowest prices on this list — you get perfectly-scrambled eggs with all the usual grilled things, toast and a heaping scoop of beans. Plus, this place is managed by Barista Academy, so you can guarantee the fancy espresso drinks you pair with your breakfast will be on point. This cafe is tucked into a pocket-sized cranny of Causeway Bay, accessible via the titular narrow corridor from the street. 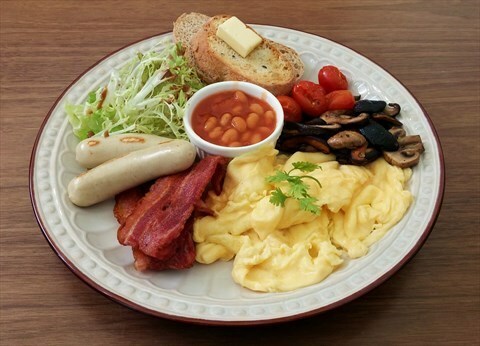 Despite their diminutive size, they still manage to serve full-size English breakfasts all day long. There are a few not entirely authentic details: a scoop of canned corn, a ketchup-scrawled, rectangular hash brown, fresh instead of grill-softened tomatoes — but it’s all quite tasty, especially the perfect scrambled eggs.